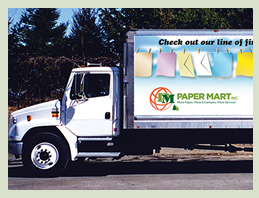 The Paper Mart order desk is open until 6:30pm EST for next-day delivery and provides guaranteed turn around for print requests. Our fleet of 22 company-owned and operated trucks provides fast delivery within a 150 mile radius of our offices (NJ, NY, PA, CT) and flexible scheduling. Outside of that radius, we work with our network of professional shipping services to ensure you receive your order on-time and in good condition. We also offer just-in-time delivery schedules, outsourcing of warehousing needs, and customized inventory management. Contact Us to learn more about how we can meet your needs.